Perhaps as a sign of aging I nowadays take some time, sit down, relax, recollect and synthesise the whats/whys/whos/whens of certain events during those good old days when I was a ‘parasite’ to most of my immediate society. I recently remembered one such event which happened during my final (pre-university) East African ‘A’ Level chemistry practical examination. Having revisited my chemistry theory, I have now concluded that whoever set one of the questions, and whoever was involved in approving it as an examinable question were sadists – people who get pleasure out of physically or emotionally harming someone. Our chemistry lab was small for exam purposes. Therefore, we were split into two groups/shifts. I happened to be in the first group/shift. The exam comprised three compulsory questions. The first question required us to make a certain substance from a specimen using a specified procedure. I happened to be on the front row with my classmate, now Dr David Tigawalana – the only one I remember during that exam because of what happened that morning! We lit our bunsen burners, and started mixing our specimen with certain chemicals in a test tube and warming it as per instructions. All of a sudden, my eyes became teary and some mucous started flowing through my nostrils. This terrified me and impacted on me psychologically. I convinced myself that I was reacting to the exam, or to put it bluntly, ‘fearing’ the exam. I decided that I wasn’t going to look left, to avoid David Tigawalana noticing my ordeal. I also decided not to look at the invigilators, least they also notice my tribulations. Because of the teary and psychological state I was in, I accidentally spilled some of my spacemen. I now didn’t have enough spacemen to conduct all the tests! So I had no option but to face my neighbour, David, request him for some of his spacemen, and in the process let him see my teary and mucousy face! I quietly turned to him, and asked (signalled) for some of his spacemen. He was a perfect good Samaritan – he nodded in acceptance. That is how and why I remember that David sat (or rather stood – we didn’t sit) next to me during that exam. However, I noticed his teary eyes! Then I glanced behind me and saw teary eyes! Then I looked at the supervisors and saw teary eyes! The chief supervisor was a British, literature teacher called David Allen (RIP) – renown for his strictness. I noticed that he was wipping his eyes with a handkerchief every other second and opening them very widely. I learnt later (after the exam) that Mr Allen, with neither knowledge nor interest in laboratory chemicals thought that we (students) were playing ‘tricks’ on him so that he temporarily leaves the exam laboratory and we ‘cheat’ during the exam! So he ‘swore’ to himself that he wasn’t going to allow that to happen. The exam required us to perform a process called esterification, and identify the end product – an ester that had been formed. In fact, because of their distinctive smell, when we left the exam lab and we found the second group/shift waiting outside, one of them, now Dr Ian Olwoch, stated that … ‘that is a clear distinct smell of an ester…’. Effectvelly, although the second group didn’t know the exact question, they knew the ‘broad’ answer because of the very nature of product of that spacemen! Esters are normally produced in the lab from the condensation of an acid and an alcohol. They are produced when organic acids (natural acids – i.e. acids with a carbon element), are heated with alcohols in the presence of an acid catalyst. Examples of organic acids are citric acid (citrus fruits), acetic acid (vinegar), butanoic acid (rancid butter), formic acid and propanol. The catalyst is usually a non-organic acid such as concentrated sulphuric acid, hydrochloric acid, phosphoric acid, fonic acid or the acid form of an ion exchange resin. In our case, while I don’t remember the exact combination of chemicals we used, I believe the ester was benzyl acetate (found in oranges). I am convinced the alcohol was a benzyl because as explained below, this is the only combination that could have produced a by-product crying gas, benzyl chloride. • Distilled water is added to separate the ester from the acid residues. • Sodium bicarbonate (soda ash) solution is added to remove any excess water. • Saturated sodium chloride (salt) solution is added to neutralise traces of acetic acid and any remaining sulpheric acid. This experiment was carried out by students under exam tension. There were neither procedures nor tests to ensure that 100% purification had been achieved. Our solutions must have still contained some leftover starting materials, which enabled two additional reactions to take place. Firstly, the catalyst we used, concentrated sulphuric acid, reacted with sodium chloride (salt) to produce hydrochloric acid and sodium hydrogen sulphate. This by-product of our experiment, benzyl chloride is often referred to as ‘crying gas’. The acute short-term effects of benzyl chloride from inhalation exposure in humans consist of severe irritation of the upper respiratory tract, skin, eyes, and mucous membranes, and lung damage along with pulmonary edema (fluid in lungs). Exposure to high concentrations also causes effects on the central nervous system. 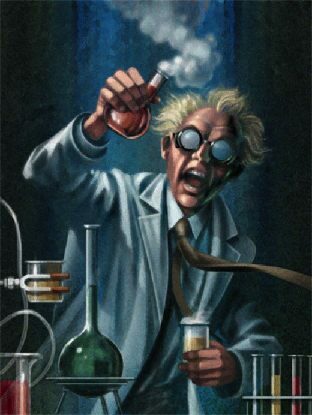 Because it was a by-product of our experiment, each of us produced only small amounts, but significant enough to cause noticeable irritation to the eyes and mucous membranes of everyone in the lab. An experiment with such a by-product is clearly a dangerous experiment. It is supposed to be conducted under controlled conditions – i.e. the apparatus should be put in a fume hood, those conducting the experiment should wear gloves and eyes protectors and nose masks. To the best of my knowledge, apart from one fume hood per chemistry lab, no school labs in Uganda’s secondary schools had any additional safety equipment. All the students who sat that chemistry exam were therefore exposed to the dangers of benzyl chloride – curtsey of sadistic examiners at the East African Examination Board!